Originally made commercially available in 1963 by Remington for use in the Remington Model 760 pump-action rifle. 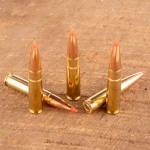 5.56x45mm NATO is the military version of the .223 Rem, though it is loaded to a higher pressure. 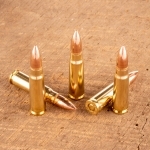 Most commonly loaded with bullet weights ranging from 55 grains to 62 grains, though lighter and heavier bullets are commercially available. 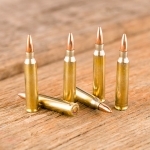 The AR-15 rifle is the most popular firearm chambered in .223 Rem. 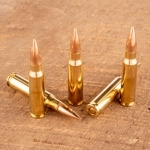 Widely used for competition, hunting and home-defense. Target Barn typically has new and remanufactured bulk .223 Rem in-stock.